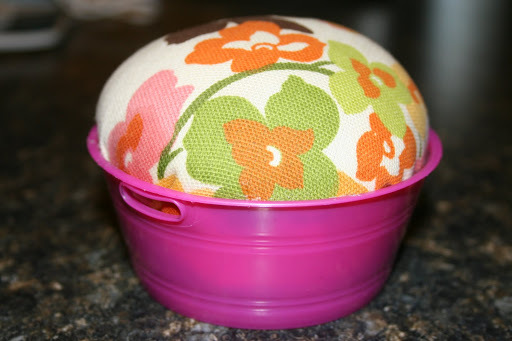 I was looking for pin cushions on line the other day and came across a forum and the ladies on there had made their own pin cushions. So I set out to make my own also. I found this little pink tub that I have had for several years to organize school supplies in like erasers and paper clips. I have a few more but can’t find them. I used pencil shavings, hair from our brushes, and the inside wood shavings from the inside of one of my ugly plain pin cushions. I took these idea’s from that forum. The also suggested bird gravel that you put in the bottom of bird cages, this is suppose to keep your pins sharp. I was trying to do this in a free manner so I didn’t go buy anything. I decided to use the fabric I used to recover the school chairs. Since I use the school room as my craft sewing room also, it all matches. Grabbed the hot glue gun. I also grabbed some black beans out of the pantry to add weight so the pin cushion doesn’t slide all over the table so easy. Then the last thing I used was some polyfill that I had laying around. I didn’t think of getting pictues of my journey. I really didn’t think of posting it. But I am now!!! I used the polyfill to make pouches. One for the beans for the bottom and then one for all the “cushion” parts. Once I got these 2 pouches filled, I put them together and wrapped the fabric around tightly. I did not worry about sewing the fabric and I found a rubber band and used that to keep the pouches in the fabric, to make a ball shape. I cut the extra fabric off the “ball”. I ended up putting more beans in the bottom to take up the spare space. Once I got the fabric ball situated how I wanted it, I got out the hot glue gun. I went around the fabric and bucket with the glue. It was not an easy task. I made a bit of a mess on one side but its all ok. So this is how it turned out! And I forgot to mention that I also added some essential lavendar oil to the sides. Now when I walk in my office where I keep my sewing supplies, it smells soo good. 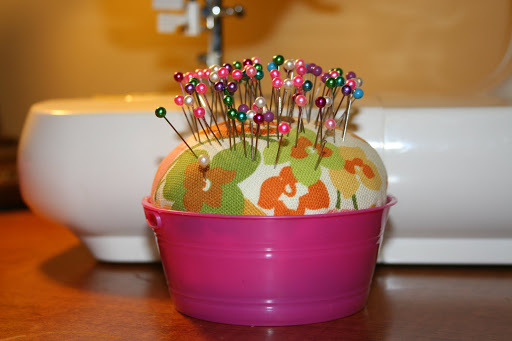 1 Response to Home Made Pin Cushion!! Reblogged this on Living The Cottage Life.